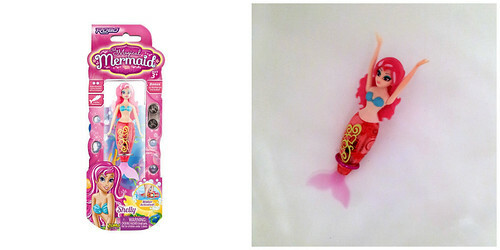 If you’re looking for a cute gift for girls ages 3-10 for under $10, the My Magical Mermaid from Zuru Toys is a safe bet. 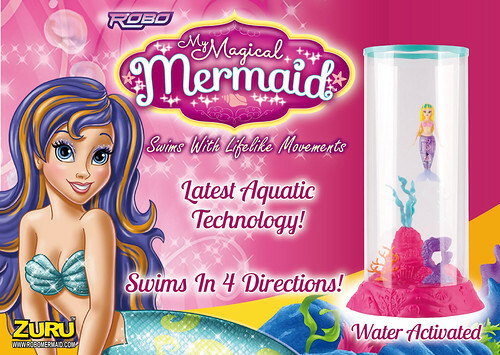 The mermaid is about half the size of a Barbie doll and comes with two sets of batteries (one set already installed plus a spare set in the box) and three different weight rings so she is ready to jump in the water straight out of the package. The mermaid’s tail flutters when she makes contact with water or if you pinch the two black buttons in the tail. The tail flutters in four different rhythms to create twirls and lifelike changes in swim direction. She stops fluttering when left to dry for a few minutes. The My Magic Mermaid dolls are intended to swim in their branded aquarium, but since we didn’t have one of those, we just dunked ours into the bathtub. We realized due to her small size, having bubbles in the tub only makes it harder to spot her when she sinks to the bottom. So for bath number two, we skipped the bubbles and had fun watching her scoot all over the tub on her own. The toy is plastic and has little education value, but it sure is fun. My girls WANT to take baths so they can play with the mermaid. I have a grandchild that is mermaid obsessed! She would just cherish this doll! My little niece would love this, especially when the tail flutters ! How fun! This looks like a lot of fun. My daughter loves playing with toys in the bath so this would be awesome to get for her and at a great price!! What a cute toy! 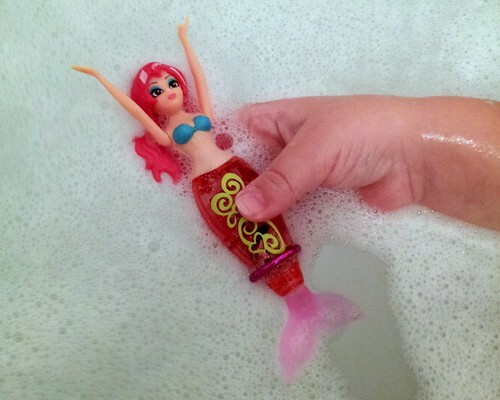 I love water toys, and I love that this little mermaid can swim in water. It would make a great stocking stuffer for my niece. This is so cute, my daughter would love to play with this in the bath. What a perfect stocking stuffer. This is so cute. Every little girl adores mermaids!